People aged 30 and under face working until the age of 70 before they can qualify for a state pension under projections drawn up by two separate reports requested by the Government. Ministers are under pressure to address the expected rise in the cost of pensions, which stems from longer life expectancy and the increasing ratio of pensioners to workers, leaving at least six million people facing the prospect of having to work longer. Ministers will decide in May whether to go ahead with the proposals from both reports. In a ‘worst-case’ scenario, experts from the Government Actuary’s Department (GAD) say in the first report thats the state pension age could be raised as high as 70 as soon as 2054 for anyone currently aged 30 or under. The ‘extreme’ scenario involves an assumption that people spend 32 per cent of their adult life in retirement. The GAD calculations also suggest that the change in the retirement age from 67 to 68 could be pulled forward by as much as 16 years. The possibility of varying the state pension age to reflect varying life expectancies across the country had also been raised. But the report said having regional variations to the state pension age was not practical. The other report, by the former director-general of the Confederation of British Industry, said the aim was to ‘smooth the transition for tomorrow’s pensioners, and to try and make the future both fair and sustainable’. 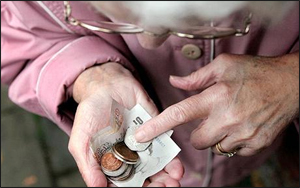 The report, by John Cridland, said the rise should happen earlier, providing greater ‘intergenerational fairness’ and keeping the state pension affordable for taxpayers. Cridland recommends bringing the change from 67/68 forward by seven years, from 2046 to 2039. That would mean anyone currently under the age of 45 having to work an extra year. He also recommends that the pension age should never rise by more than one year in each ten-year period, therefore ending the ‘triple lock’ in parliament next year. Up to now the triple lock has guaranteed that the state pension rises each year by inflation.